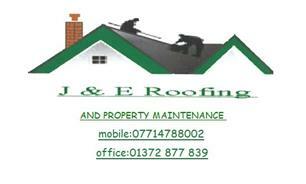 J&E Property Maintenance - Builder, Roofer based in Epsom, Surrey. With 35 years experience, we have been working as a family business for over 20 years. We specialise in roofing and building works and can also help with your fencings, gardening, patios, driveways and much more! We work as a team and pride ourselves on being very reliable and well mannered. We will do what we can to meet and hopefully exceed your needs and expectations. Please call Jim on 07714 788002 for more information and friendly advice.